Avid Slow Food Supporters, De Vecchi and Taverna have devoted themselves to making the very best quality gelato possible, using only the finest ingredients they can find. 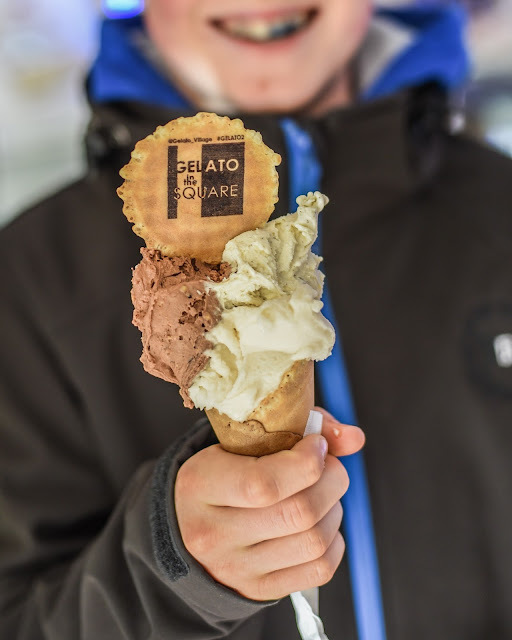 Inspired by the Slow Food movement's slogan, (itself born in Bra, Piemonte) they searched for a way to make gelato that was Good, Clean and Fair and struck up a partnership with one of the only dairy farmers in the county of Leicestershire that is free of a contract with the big supermarkets. Belvoir Ridge Creamery has a unique rare breed herd of Red Poll cattle, one of the few that remains, a cow which has much in common with the Razza Piemontese in terms of the quality of meat and milk it produces, coupled with relatively low yields which has meant the Red Poll has been somewhat left behind when it comes to commercial production. Paying Belvoir Ridge a fair price for their milk and cream gave Gelato Village a unique base for its products - a flavourful and memorable local ingredient which formed the beginnings of their deep relationships with the local food community, which now includes a large network of food and drink producers in the region. However, they do not solely make use of their local food environment for inspiration. The influence of their home region has never left them and they feel a deep affinity to the ingredients for which Piemonte is justifiably famous. 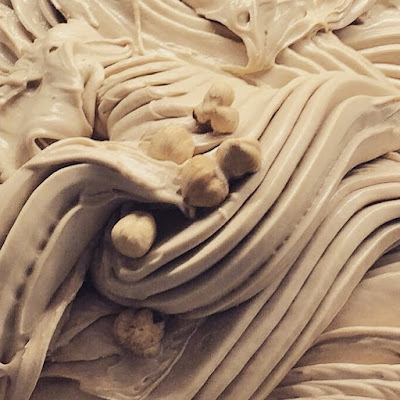 One of the biggest selling gelato that Gelato Village makes is hazelnut, made with 100% Tonda Gentile PGI nuts, widely regarded as some of the best in the world. In his creation of new recipes, Antonio De Vecchi also draws on his food heritage. 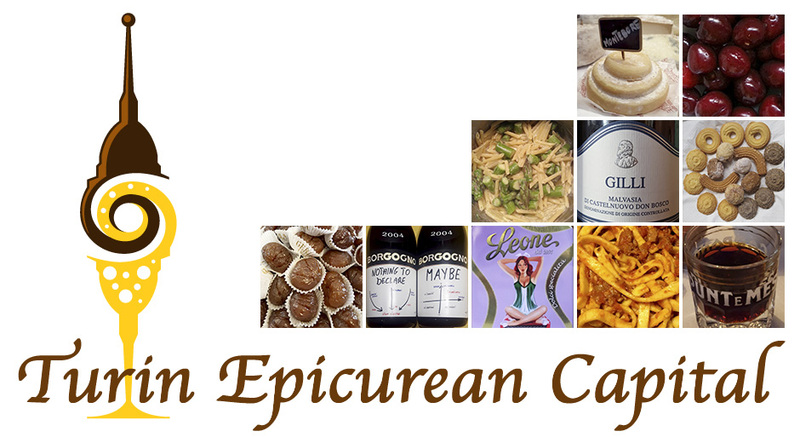 Crafting tiramisu in gelato is relatively easy - British people are familiar with the dessert and happy to try it. Bônet is a harder sell, as it is practically unknown in England. 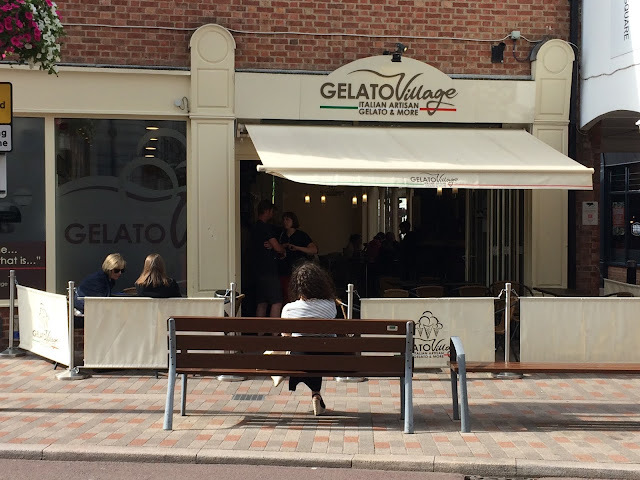 However, a gelato constructed with the same components as the classic dessert, with its combination of rich, dark chocolate, hazelnut, amaretti and a subtle dash of rum, has tickled the fancy of the British consumer and is now a regular feature on Gelato Village's rotation. 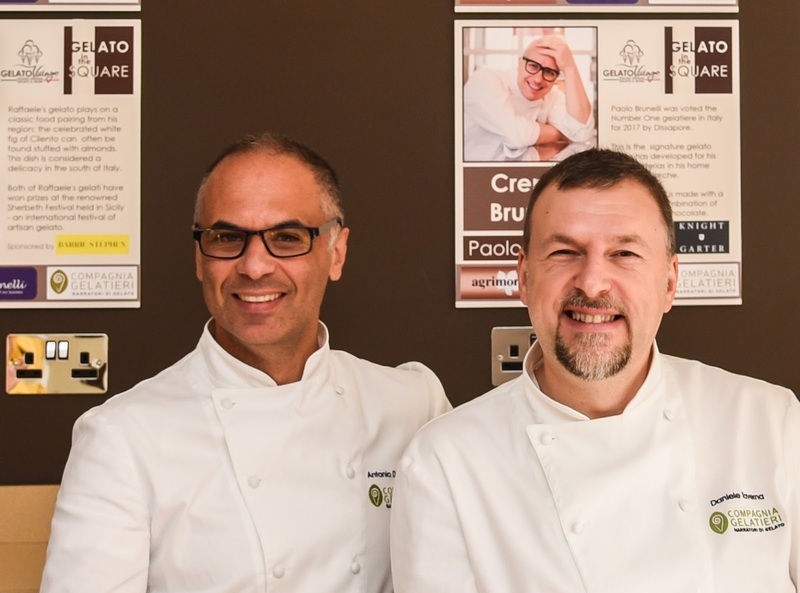 Wider Italian influences are also visible in the Leicester gelateria - PDO pistachios from Bronte in Sicily as well as homemade Sicilian cannoli grace the menu, along with freshly baked crostata and Neapolitan pastiera, but the Piemontese connection always comes through strongest of all. The natural soft drinks of Baladin, the Cuneo company also famous for their beer brewing, are so popular that customers travel for many miles to enjoy them in Gelato Village. Leone sweets and chocolates are also very difficult to find in England, but not in Leicester! They offer ranges which are suitable for vegans and those with gluten intolerances and so have found many loyal followers amongst the diverse communities of Leicester. Finally, with Christmas looming just around the corner, excitement is building to see the return of Galup Panettone, and the gelato made with this king of the Natale celebration. 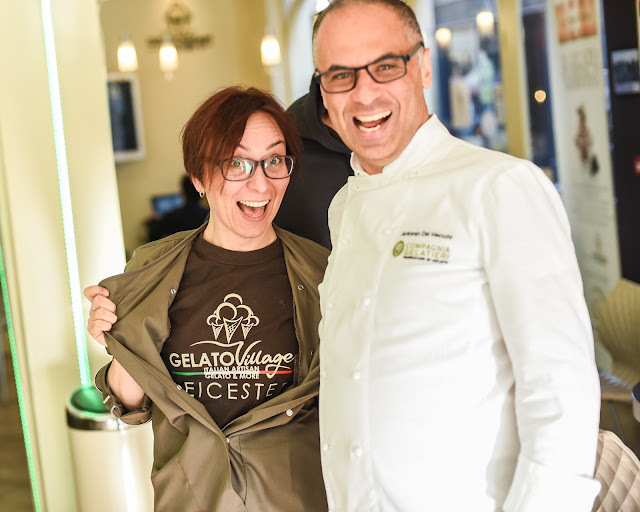 At their recent Gelato in the Square event, Gelato Village brought ten Maestri Gelatieri to the UK who were all committed to the same principles of artisan gelato making using the traditional mantecazione method and fresh ingredients. Two of them, Alessia Torselli and Vera Castrovilli, also came from Piemonte. 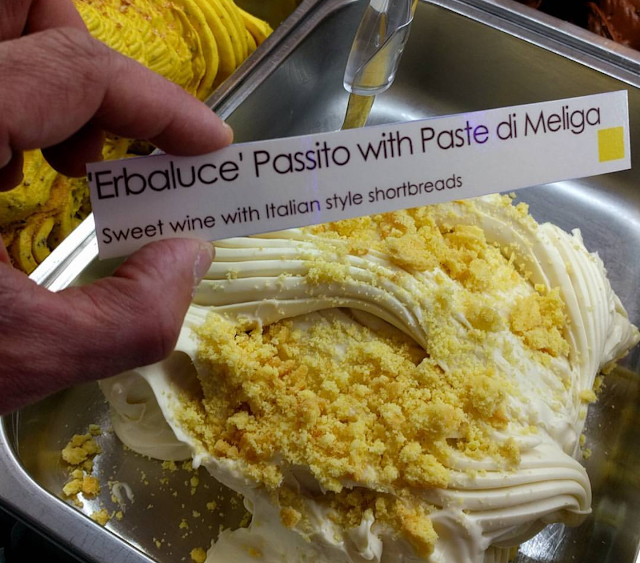 Their gelateria, Nevedarance in Caluso is famed for its use of the local Passito, a sweet wine crafted from the crisp beauty of the Erbaluce grape, in their gelato. They brought this recipe to the Gelato Village laboratory and De Vecchi and Taverna were so inspired by the quality of the flavour brought by this specialist wine of the region that they are now continuing to make their own recipe Passito gelato, using the wine that remained after the event. It's a culinary adventure for Gelato Village. Trying to explain to their customers the difference between commercially manufactured products and their artisan craft is one hurdle to cross, whilst explaining the influence of their Piemontese food heritage is another. But it's a challenge that they continue to embrace and, given the amount of 'superfans' who grace the doors of the gelateria week after week throughout the year and whatever the weather, it would seem that the joy they take in their work is contagious.